What is it? Dry rot is a phenomenon that can impact all varieties of wood. When this fungus spreads throughout the interior of wood, it becomes weak and will start breaking apart. When dry rot occurs in a building, the structural integrity often becomes compromised. What are Signs of Dry Rot? Dry rot is such a nuisance because the early stages are difficult to identify to the untrained eye. Adding to the confusion is the fact that it can vary in appearance. Identifiers include darkened or shrunken wood. Coloring is typically off-white or gray. Wood affected by dry rot will shrink and crack. It becomes soft to the touch and warp. How Does it Spread? Dry rot is fed by moisture inside the wood and in order for it to spread; it needs a source of moisture. Because dry rot causes the affected wood to crumble and separate from the unaffected wood, the unaffected wood becomes exposed and soon becomes infected. Why Does it Happen? There are lots of occurrences that result in dry rot, though most have to do with proper water management in the home. 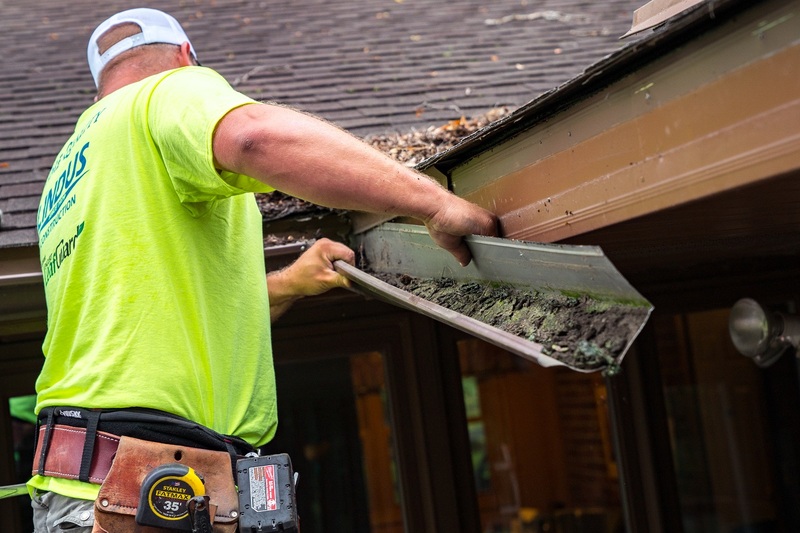 Clogged or broken gutters and downspouts can increase the likelihood of dry rot, as can improper flashing on your roof and around your chimney. Inadequate ventilation can also contribute to dry rot. It’s a common misconception that dry rot only occurs in older buildings. This couldn’t be further from the truth. For example, if siding isn’t installed correctly and water is able to permeate through the siding, it’s only a matter of time before thousands of dollars of damage is caused. For this reason, it’s crucial to work with a reputable licensed and insured company who know what they’re doing and is willing to stand behind the work they perform. Gutters with screens are prone to clogging, which can eventually lead to dry rot. How Can it Be Eradicated? Full eradication of dry rot is crucial because failure to do so can result in it reappearing. The only way to kill dry rot is to kill its source of moisture. Once this has been accomplished, the affected areas must be dried completely. From there, the fungus that caused the dry rot must be treated. The final step is repairing the damage. This process should be completed by a licensed professional who can effectively determine the full extent of the dry rot. Failure to fully complete any of the steps listed above can result in the dry rot manifesting itself once again. After the hail storm our home needed a new roof and all new siding, window trim...the whole nine yards. From the salesperson to the crew that was doing the work, all were all wonderful. Answered every question, got the work done on time ( and looks great) cleaned up after every day and when the job was done you would never know that they were there. I would highly recommend Lindus Construction! We were very pleased with everyone involved with the company that worked with us. - Jaide S.
"Thank you for your attention to detail, answering of my questions, and your patience. Your professional manner is PERFECT. It was nice to have met you." - Donna D.
"Both guys were friendly and greeted myself and my wife if we were coming or going. They kept me posted of any issues and where they were with the job and when they would be finished. Too often in business we only hear about the bad employees and bad work. Not with these guys. Can’t say enough about how great it was. 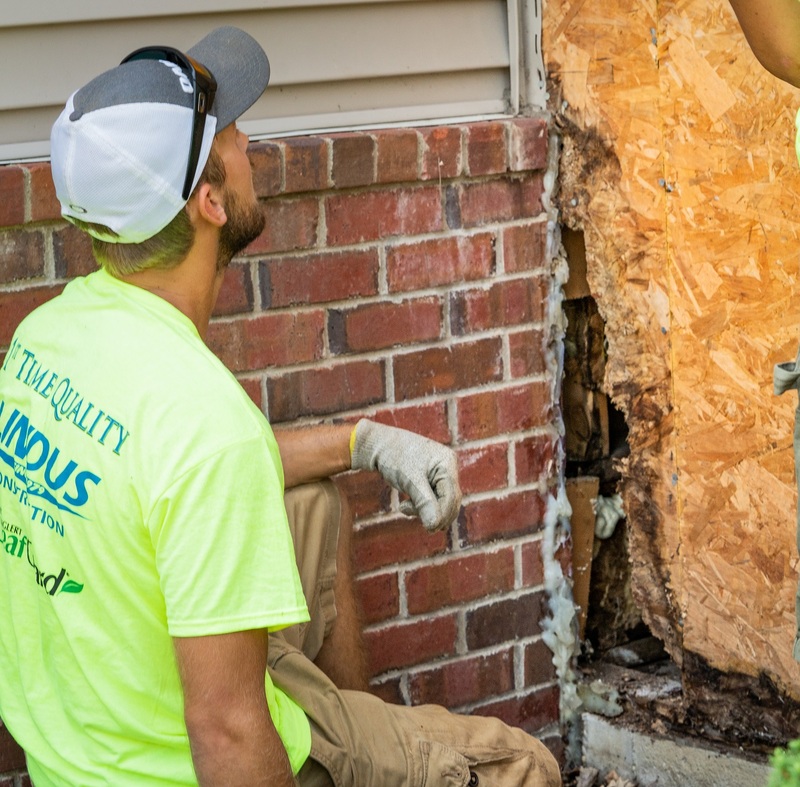 Because of these two individuals I will DEFINITELY hire Lindus Construction again." - Brad E.
"Salesman Corey was our hero when we had to have our roof replaced due to storm damage. He took care of the entire process for us, and made sure we were happy with the end result. When we decided to replace our siding, and add a porch, we knew we wanted to go with someone who we could trust and was professional, and Lindus Construction fit those requirements. This project gave our home an entirely new look. They worked hard and kept it professional. We will use Lindus again!" - Pat K.
3D renderings allowed this couple to create the perfect color concept for their home's new siding.